This homepage includes links to external Internet sites. I do not have any influence on the contents of these sides. For this reason I would like to dissociate myself hereby from contents of those linked sites. Some sites i found to be very interesting. www.det2014.de National meeting of the friends of 2CV from 23rd to 27th of July 2014 in Hofheim-Diedenbergen near Frankfurt / Main. www.franzose.de My hardware-distributor. Here you can get mostly everything (shipping worldwide). www.f-w-meisen.de Another spareparts shop, being recommended by 2CV drivers. www.pp-2cv.be A Belgian sparepart-shop with a lot of 'know how'. You can get glass fibre parts for racing ducks, ventilated disc brakes and other innovative parts. In english and frensh Language. www.savoiacars.com New parts for the 2CV are created far away from the country of origin. In Argentina you can find new engines and suspension parts with innovating ideas. www.2cv-dekore.eu Spot, Dolly, Charleston, Beachcomber and Co need special stickers when beeing restored. Here you can get high quality versions, produced as replicas. Individual labels for your special creations can be realized too. The homepage is written in German, but you can also mail in English and Frensh. http://www.sitruuna.com/2cvstuff No spare parts, but many articles, a 2CV driver could need sometime are listed at the pages of Jukka Isomäki from Finland. The pages are in english language. http://www.cygnus-kitcar.nl/ The homepage of the manufacturer of the Cygnus, a kitcar based on the 2CV or the Dyane. http://www.condesita.com You can rent a very beautiful Condesa in Poland. www.polstereibedarf-online.de The distributor of the drapery i used for the seats and the top. I am doing all servicing by myself, so I can't tell you details about the garages listed here. www.ulis-oldtimerscheune.de "Ulis Oldie Scheune" is a garage in Germany. Besides overhauling 2CVs, Uli is also a talented goldsmith, so you can get beautiful miniatures or your beauty at his page. www.duckservice.de/ This garage is located in Bad Bentheim near the dutch border. www.philcaron.com If you are living next to Hamden, Conneticut, than you should have a look at the garage of Phil Caron. If you are living far, far away, click at the link to see many interesting photos of his work. www.derentenmann-berlin.de Clemens is domiciled in Berlin and is a very professional 2CV mechanic. His homepage is worth visiting, because he is handing a lot of knowledge to the readers. He is the author of some books around the 2CV technology, too. www.entenkult.de "Entenkult" is the name of the garage of Markus Kestner in Mainz (Germany). www.hantschel.de Björn Hantschel's garage can be found in Bad Krotzingen (Germany). www.entendoktor.de The garage of Dieter Meierkord is in Düren (Germany). www.entenliebe.de Thomas Grotepaß is working in his garage in Hamburg (Germany). Additionally he is arranging trips and small meetings for 2CVstogether with his wife Christa. http://www.2cv.fi/apuahelpUK.shtml APUA-Help is an international network of 2CV repairmen, willing to help stranded 2CV drivers. www.2cvforum.de A German 2CV-Forum with lots of help for duckdrivers. forum.andre-citroen-club.de German forum about all Citroën cars. http://79498.forumromanum.com Non technical questions about 2CV are treated at this German forum. http://pembleton.co.uk/bulletinboard/index.php English forum about the Pembleton kitcar. http://www.citronik.dk/blg/default Danish forum about old Citroän cars. http://www.2cvclubitalia.com/public/smf Italian forum about the 2CV. http://forum.2cv.nl Dutch forum about the 2CV. http://2cvclub.frix.pl Polnish forum about the 2CV. http:www.nytimes.com Plenty of smiles per Gallon. Really nice article from the New York Times. www.citroenchen.de German online-magazine about 2CV and other Citroëns. www.der-entenschnabel.de German printmagazine about the 2CV. www.motor-klassik.de/ German magazine about classic cars. You can find an article at the column veteran car. www.auto-motor-und-sport.de The online-magazine for up-to-date cars of the publisher above. 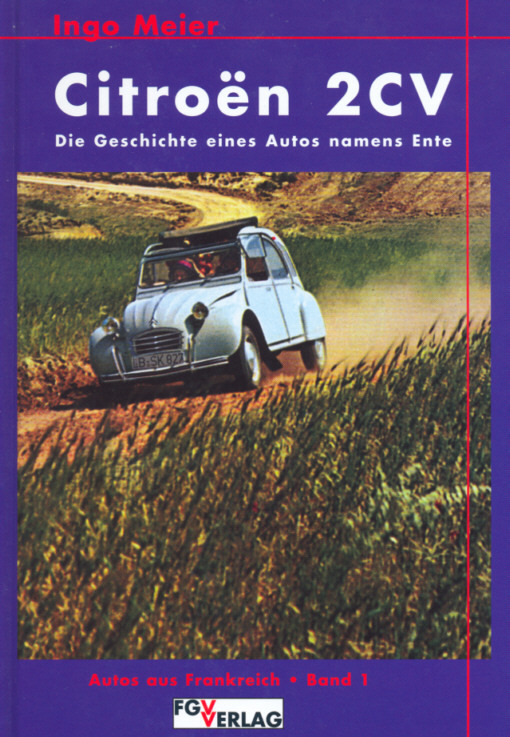 "Auto Motor und Sport" is published for many years and so you can find reports about the 2CV at early copies. Three reports can be found at the column Car reviews. www.autobild.de/ German printmagazine about the 2CV. You can find an artikle at the column veteran car. http://www.2cv-r4.de German pages of the friends of 2CV Dithmarschen. http://www.der-ent-husiast-2cv.de German pages of an 2cv enthusiast. http://2cvcharleston.eu The homepage of Alex from Bulgaria about his black and red Charleston beauty. It's written in Cyrillic letters, but the pictures are really excellent! So have a click at the pages. http://www.2cvclub.pl The homepage of the Polnish 2CV Club. http://www.mukoci.de The homepage of Murat, which was created because of his roundtrip fom Wuppertal (Germany) to Turkey and back. Available in German and Turkish language. peripleenorient.free.fr Traveling to India with a 2CV! An adventurous trip with a hompage in French lettering and with multilingual pictures. 2cv1958azpo.free.fr French version of Entmontage. The pictures of the restauration of an AZPO built in 1958 are speaking an international language. www.Schmuckl.de/ Not only 2CVs are kept alive by Jürgen. (German language). www.2cv.fi/ The pages of the Finnish 2CV Guild. www.citdoks.de Almost all documents about Citroëns are available for free download at this page. A giant bonanza for tinkerers! www.action-ents-saar.de A very active 2CV drivers club is domiciled at the Saarland (German region). The Action Ents are well known for their bizarre conversions and it is worth visiting their homepage. Available in French and German language. Gerry is also a 2CV owner and it is worth visiting his homepages. You can find his 'Fireball' at my picture gallery, too. (German language). www.sacramentovalleycitroen.com The homepage of the "Sacramento Valley Citroën Club". Even far away from Paris you can find french cars with the doubble chevron at their hood. www.ententag.de Homepage of the German meeting 'TÜV meets 2CV' in Wuppertal - I enjoyed it very much (only in German language). www.2cvfliegerclub.de The pages of the 'Flying-Club' Dinslaken. More than just a description of the club can be read here. If you are living next to Dinslaken, visit the meetings, elsewise have a look at the well done homepage (only in German language). www.entenbilder.de Elvis lives! Private homepage about a duck called Elvis and many Pictures from worldmeetings. Only in German. www.2cv-liebhaber.de Pages about a lovely car (guess which). Only in German. www.2cv-roadster.de Sites of Michels and his lovely roadster. Only in German. www.hartmutwoernerberlin.de Not only, but also 2CVs are presented at the pages of Hartmut. Only in German language. www.autopasion18.com Infos about the Codesa, a kitcar based on the 2CV are available here. It is a spanish site, but the pictures speak an universal language. www.2cvracing.org.uk If you like to know, how to make a racing machine out of a unhurried frensh everyday car, you should take a look at the sites of the british racing club. www.mehariclub.com/ In France, at the heart of the Provence, the Mehari-Club of Cassis has it's headquater. The members of the club are producing many spare parts in some extends even with the original tools of Citroën. Have a look at their homepage, written in French, English, Italian and Spanish language. Very complicated address for a simple car - private Homepage about one 'Deux Chevaux', then two 'Deux Chevaux' and a lot of more horses. http://home.online.no/~tellef2/e-index.htm The homepage of the Ellefsrøds from Sandefjord in Norway. Driving 2CV's is one (but not the only) of their great passions. Here I found a hint how to 'repair' a broken crankcase breather. Mostly written in english. www.2cv-power.de All about 2CV-engines and tuning. Only in German. Ignition adjustment can be found here. http://citcity.citroen1.info/2CV Many, many pictures from assembly to prototypes and comics. www.htbla-weiz.ac.at A group of Students of the Höheren Technischen Bundeslehranstalt Weiz built an electric 2CV. The PDF-document is here (1,5Mb). Only in german. http://www.pixum.de See how a very rusty frame is deconstructed. The photo album bares a deep insight. www.2cv.nl There is allso a mass appeal of the most beautiful car of the world in the netherlands. This link leads to the biggest dutch omline-presence. That is written on the starting page and you will belief when clicking through. It's only available in Dutch to my own regret, but it is nevertheless worth visiting. www.Fiat-126-Forum.de Its about my second car, the fiat 126. Only in german. www.klassikertage.de The young- and oldtimer meeting in Hattersheim is organized by the 'Scuderia Lufthansa Classico' and always worth visiting. www.wikipedia.org Wikipedia has of course own pages about the 2CV. www.autonews.com Portraits about car manufacturers. The Link leads to Andre Citroën, but competitors are also found here. http://oplossing.jouwpagina.nl/ If you like to do some exercises before restoring your own 2CV go to this page and download a cut-out-sheet of your dream-car. www.tom-plate.de/index_comic.html Some funny 2CV-comics. Very recommendable, but only in German language. www.isetta-freunde.de Smaller than the 2CV was the BMW-Isetta. German pages about this lovely car. www.clever-project.net A concept-car worth producing. Three wheels and low fuel-consumption. Advancement like Andre Citroën would have done. http://www.linux.org The second bird in my life is Tux, the mascot of the operating system Linux. The technology behind is as tansparent as those of the 2 CV and that's the good thing! As introduction to the whole theme I'd like to link to this site.